At the top of the Royal Mile is Edinburgh's only functioning tartan weaving mill, housed in what used to be the city's main water reservoir. Prior to the 17th century, the city's water supply was the stagnant Nor' Loch, on the site of today's Princes Street Gardens, which also served as the sewage outlet. In the 1670s a network of pipes finally brought fresh water from Comiston Springs, to the south of the city, to this large water tank constructed at the top of the Royal Mile. The reservoir tank was replaced in 1849, and today this immense sandstone structure houses the weaving mill and associated shop. Much of the building is below ground level, making it significantly larger than the exterior would suggest. The smooth, sloping internal walls still bear water markings of its previous use, and looking up from the bottom floor you get a tremendous sense of the scale of this space, which at one time provided fresh running water to much of the Old Town. Across the road from the Weaving Mill is the Scotch Whisky Experience, a popular attraction charting the history and production of Scotland's greatest export. The building itself was formerly Castle Hill School, opened in 1888, with over 800 pupils from the local area. As was typical at the time, boys and girls in the school were taught separately, and at the lower entrance on Johnston Terrace the separate access routes are still visible, marked Boys and Girls in the red sandstone archways. Inside the building, visitors to the Scotch Whisky Experience will note the intriguing feature of a double helix internal staircase, which ensured the children didn't mix even on the staircases as they went to class. The school closed in 1951, but the building continues its educational function by initiating visitors from all over the world into the secrets of Scotch whisky. Before bathrooms were commonplace in houses, public baths offered a place for people to get clean, and one such bath house – the first of its kind in Edinburgh – was located on Infirmary Street, off South Bridge. The bath opened in 1885, and remained in use right up until the 1990s, when the building was closed, and the pool drained. The building fell into dereliction until a two-year redevelopment project was completed in 2009 and the building re-opened as the Dovecot Studios, a working tapestry workshop. Open to the public, there is a viewing gallery from which to watch the artists as they create tapestries on looms mounted on the workshop floor, along with a cafe and gallery space. The building itself has preserved the interior of the old baths, whilst parts of its exterior has been developed in a contemporary style which is sympathetic to the building's history and surroundings. At the very bottom of the Royal Mile, the Holyrood area was once a heavily industrial part of the city, falling into dereliction as the many breweries and similar heavy industry businesses closed in the later years of the 20th century. Efforts to revitalise the area have paid off, with the new Scottish Parliament Building, the new Scotsman newspaper offices, BBC Scotland studios as well as hotels and restaurants being developed in what were once old industrial sites. 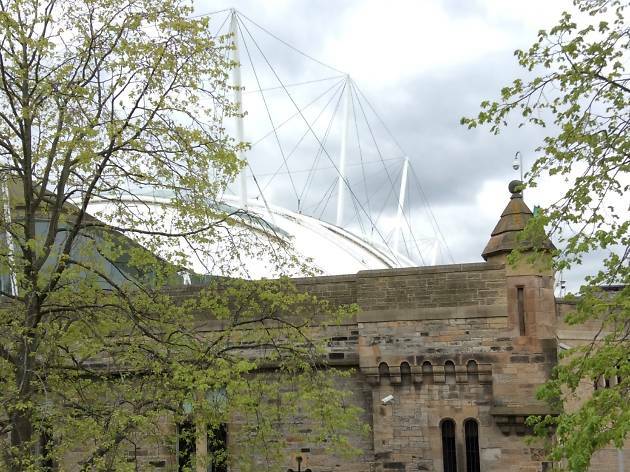 Of particular note is Our Dynamic Earth, an educational attraction commemorating the work of James Hutton, the 'father of modern geology', whose (literally) groundbreaking theories arose from studying rock formations around Arthur's Seat, in Holyrood Park, behind Our Dynamic Earth. Our Dynamic Earth's design incorporates the original wall running around the outer perimeter of the brewery site, itself a curious feature. Not all breweries featured such a heavily defensive looking wall, with castellated turrets and ornate gun loops penetrating through the brickwork; this particular site was directly across the road from the Palace of Holyroodhouse, and it is said that Queen Victoria was so displeased at having to look upon it from the palace windows that she requested the brewery construct its perimeter wall in the style of a castle, creating an illusion of grandeur, and even paid for shifts of brewery staff, dressed as guards, to patrol the 'battlements' to help sustain the illusion. Today the castle-style walls remain, whilst Our Dynamic Earth is built into the ground beneath the former brewery site, and the whole is backed by the verdant majesty of Holyrood Park. In a city with not one but two UNESCO World Heritage Sites protecting its centre from over-development, creative and interesting uses of old spaces such as these are helping to preserve the city's heritage whilst keeping pace with the demands of a modern city and its occupants. So whether you're sipping a pint in a pub which used to be a bank, watching interpretive dance in an old medical school lecture theatre, or simply shopping for ladies' underwear in a former gentlemen's club, in Edinburgh you're never far from a building with a past as well as a vibrant future. An adopted native with 16 years experience living and working in Edinburgh, and founder of EdinburghExpert.com.